Are you tired of the plot-heavy games that require 10 minutes of cutscenes before you can actually play the game again? If pure gameplay is what you want without the unnecessary fluff, then Rico is the game for you. It’s a first-person shooter (FPS) that advertises its simplicity in story and its focus on action and mayhem. Kicking open doors, shooting up bad guys, and having no deep story to make you question the morality of what you are doing is refreshing to see. Rico plays like your average FPS. You move, shoot, reload, and run just like you would in most other games. There are a few gameplay twists as well, such as the ability to kick open doors and defuse bombs in some missions. While it doesn’t offer anything that strays too far from the common FPS formula, everything just works. The default controls feel great, and there are some options available for those that want to change the stick sensitivity and even motion aiming. The game’s aesthetic seems very inspired by the likes of Grand Theft Auto. It’s easy to see the comparison in its loading screens and the character animations in cutscenes. Even the story and environments seem to take inspiration from the bleak crime-riddled city life of the games in that series. There’s also plenty of senseless violence and gore to go around, albeit without the carjacking and open world sandbox. If you liked the harsh tone of those games, then you’re in for a treat with this one. Rico does have a story, but it’s a very loose one. You play as one of four members of a special police unit who takes action when the normal police force has failed. Beyond that there isn’t much more of a story, which seemed to be a key point in the game’s marketing. The developers are aware that games today strive for deep stories and complex lessons, and they feel that not every game needs to strive for such goals. You don’t need to know the how or why when you bust into the bad guys’ places and take them down. While some people might prefer a game to prioritize its story, the decision to keep the game focused on the action is a nice change of pace and one that is welcomed in this day and age. With such a loose story, the developers were able to make a single player experience that far surpasses the idea of a traditional story mode. Case Mode procedurally generates a map of levels with branching paths. You start out in a training room and work your way through the stages in order to find and bust the ringleader of whatever case you’re on. The map layout changes with each new game and you can set your own difficulty. There’s also a time limit of 24 hours, in real time, to finish your case or you fail and have to start over with a new case. The only real issue here is the fact that every time you start over you have to complete the training level. While it makes sense story wise for you to start in a training room, there should have been a way to skip that level for those who already know how to play the game. In Quick mode, you can select between Operation, Training, and Lockdown missions. The first lets you play through a quick level, which you can randomly adjust the location, size, and enemy difficulty. Training is self-explanatory, which should make the training segment in Case Mode even more annoying since there is really no need to play through it once again. Finally there’s Lockdown, which has you facing multiple waves of enemies in an endless survival gauntlet. These modes are a nice distraction and some variety to the overall experience, but Operation Mode would have been better if it allowed for manual customization instead of just randomized options. The single player content offered is fantastic in this game, and it only gets better in multiplayer. The game supports 2 players in local and online co-op so you can help a friend through the game. Every mode can be played in both single player and co-op mode, including the Daily Play cases, which require you to be connected online even if you want to play it solo. Here you get to play a randomly generated level on all 3 difficulties, as well as both a daily Lockdown challenge and a Killhouse challenge. Don’t let that last name excite you too much, it’s just the training mode where you shoot still dummies with no real danger. The only benefit to playing these modes is to get ranked in online leaderboards for those events, which will no doubt compel some to come back again and again to try to climb to the top. You can unlock a variety of weapons and customization options as you play through the missions. You’ll really want to play through Case mode a few times to unlock more weapons and gear before joining online parties. You can also unlock special traits for your character as you level up, such as taking less damage or reducing reload time. While the game seems simple enough to jump into, harder levels will require a bit more strategy and planning with what weapons you take and what traits you’ll equip. When playing multiplayer you can see what your teammate is equipping to their character, so you’ll be able to coordinate your character’s customization with theirs. Rico’s online multiplayer runs perfectly with no control lag or weird glitches and in fact it runs just as well online as offline. In preparation for this review I found that it was sometimes difficult to find a random to team up with. This could be due to a low number of people owning the game or maybe something with my internet connection, but hopefully this improves as more people join in the fun. Obviously if you have a friend who owns the game you can directly connect so there’s no issue there. For the most part Rico delivers on its promise of fast action and fun shooting. The one aspect of the game that could stand to be improved upon is its soundtrack, which honestly feels unfinished. There aren’t many tracks in the game and in fact nothing plays while going through the levels. This makes the world feel empty and it’s a missed opportunity to have some intense cop-busting music playing throughout. Despite this small failing, Rico is a fun action game that runs quite well on the Switch! 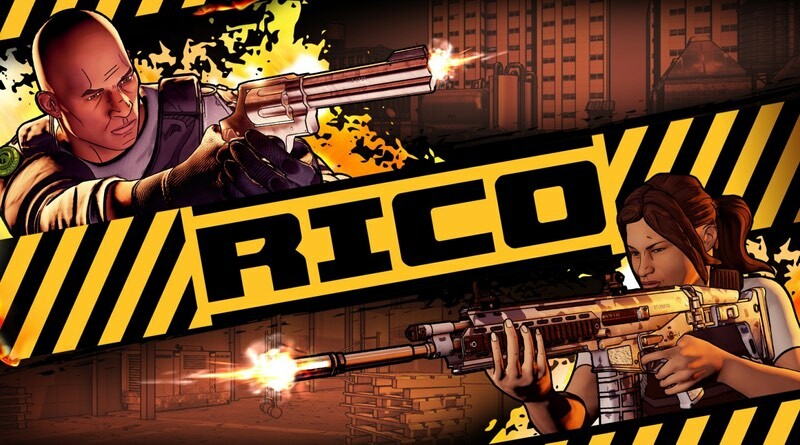 Rico is a high adrenaline action FPS that plays well and features plenty of single player and co-op content. If you’re looking for competitive PvP you’ll have to look elsewhere, but for everyone else this one’s a blast!